The difference between Clear Jel® and Sure Jell® and how it relates to pie filling. These two commercial products have very similar names but they are used in canning in very different ways. 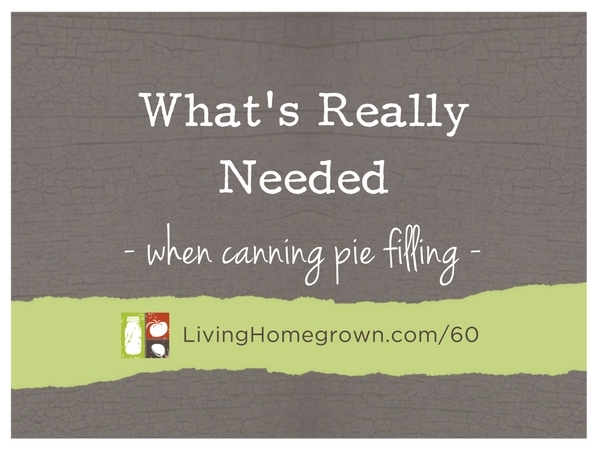 Every canning season, it causes a lot of confusion and can even trip up even the most advanced canner. So in this episode, I explain the differences between these two products and how they relate (or don’t relate) to canning up fruit pie filling. To get the full scoop, you can listen to the podcast episode above or read the full transcript below. Ultra Gel®* – as mentioned in the episode, I have not tried this product yet. It is an instant gel that is labeled as “non-GMO”. But the instant gel versions do not usually work in canning (it tends to break down). However, this brand IS labeled as a thickener for canning on the package. If you are looking to avoid GMOs, you may want to try this one. Or (as mentioned in the episode), just skip adding a thickener all together. Just catching up on some episodes. I used Pomona’s for the first time on my pears last month — I think I need more practice! But could you address the possibility of using NO sugar and/or making your own pectin from apples or quince (and are there other appropriate fruits for this) in future episodes?